The dissident Republican Easter lily emerged in 1926 as the Irish Republican movement fragmented for the third time since 1916. In late 1925, at the Ard-Fheis of the third Sinn Fein party (1923-25) Eamon de Valera resigned as president, and within months had instigated the formation of a new political party, Fianna Fáil. Once again the Sinn Féin party split and went into its fourth reformation. In early 1926 the reformed (fourth) Sinn Fein party instigated the first Day of National Commemoration, to commemorate the tenth anniversary of the 1916 Easter Rebellion at Glasnevin Cemetery on Easter Sunday. Cumann an mBan planned to take part in this event, and early in February the executive saw an opportunity to use the event to raise some funds and perhaps increase membership and they decided to hold a flag day at the cemetery. Over a series of meeting of the executive committee the women discussed the idea of the flag day, and decided instead to make it a ‘Flower Day’. Sighle Humphreys said they had considered flowers that bloomed in spring such as the crocus and the pansy, but eventually decided on a flower known generically as the Easter lily, (botanical name is Lilium longiforum). Within weeks Fiona Plunkett sent a circular letter to all branches of Cumann na mBan to explain the purpose of the Flower Day. In 1933, there was difficulty in sourcing Irish-made paper for the artificial flowers, and as Cumann na mBan were spearheading a ‘buy Irish’ campaign, a decision was taken to stop making the flowers and instead create a paper flag/badge, which could be worn on the lapel. 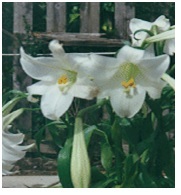 However, the Lilium longiforum/Easter Lily did not transfer well to the flag and the resulting image is more like the Calla lily. The design they chose is the same design that is sold to this day. 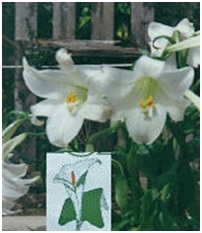 1933 Republican Easter lily (lapel) flag depicting the Calla lily. Cumann an mBan did not recognise the Irish Free State and from the beginning the women refused to apply for a licence to sell the Easter lily. 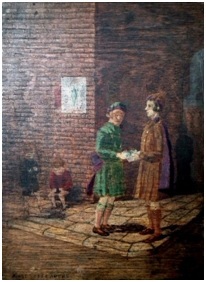 It was illegal to sell the Easter lily on the streets without the permit, and over subsequent decades this led to running battles between Gardaí and the sellers and this led to the misconception that the authorities objected to the sale of the symbol itself. The Easter lily campaign experienced a split in 1970 after the Sinn Féin Party was fragmented by another division, that created Republican Sinn Fein and Provisional Sinn Féin. The former began to sell the lily with a sticky back, while the Provisionals retained the original pin. (giving rise to the expression in the vernacular, the stickies and the pinnies’). In the mid-1990s the Provisional Sinn Féin shop began to sell it in brooch form. Ninety years after its inauguration the Republican Easter lily has remained a potent symbol within the fragmented of the Irish dissident republican movement. It was never a National Symbol. 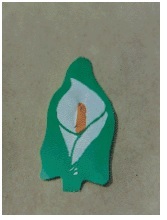 The dissident Republican Easter lily can now be bought in all forms, badges, brooches, and various forms of jewellery in tourist shops in Sinn Féin shops, and on the internet. Furthermore, because the image was never patented anyone can produce the Republican lily for sale. 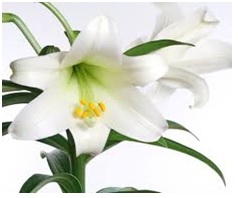 Currently, there are several factories in China manufacturing the Easter lily in all the aforementioned forms for the Irish and international market and they are ‘making a killing’. The dissident Republican Easter lily has in this centenary year become very profitable for non- political entrepreneurs. Those stalwart women of 1926 can only lie in there graves and weep. [iii] ‘Anti State activities’ 4 April 1931, National Archives Ireland, Dept. Taoiseach Files, S 5864 (A).